Igor Stravinsky’s opera Firebird opera opened in Paris on June 25, 1910. The firebird is a creature from Slavic fairy tale. The opera is a mix of this and another fairy tale called Koschei the Deathless, about a magician who cannot be killed like a mortal because his soul is separate from his body, inside a needle, hidden inside an egg in a duck, which is in a hare inside of an iron chest that is buried under an oak tree on an island. Tamara Karsavina as the firebird and Michel Fokine as prince Ivan in the 1910 Ballets Russes ballet The Firebird. 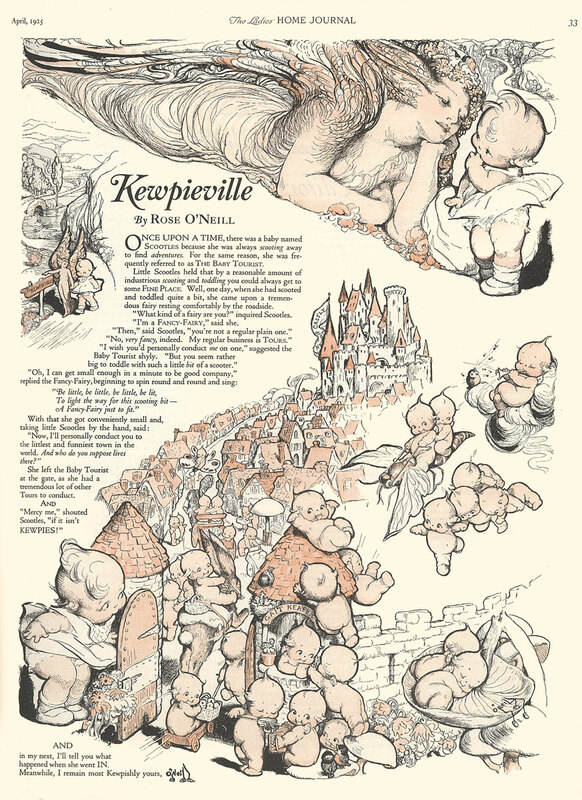 June 25th is the birthday of illustrator and creator of Kewpies, Rose Cecil O’Neill, who was born in 1874. Writer Frigyes Karinthy was born June 25, 1887. He was the first person to introduce the concept of six degrees of separation, in the story Láncszemek (translation Chains). Writer George Orwell was born June 25, 1903. His given name was Eric Arthur Blair. Philosopher Willard VanOrman Quine was born June 25, 1908. Belgian author and illustrator Pierre Culliford was born June 25, 1928. He is better known by his pen name Peyo, and he created The Smurfs. They started as a Belgian comic strip in 1958, and were called Les Schtroumpfs. These pages are from the 1958 story Les Schtroumpfs Noir. These pages are from the 1958 story Les Schtroumpfs Noir. In a nutshell, the plot involves a smurf getting bit by a poisonous black fly, who then has to run around biting and infecting other smurfs. So, basically a precursor to Night of the Living Dead. Governor of Massachusetts John Winthrop of Massachusetts introduced the fork to colonial America. This factoid was listed on The Old Farmer’s Almanac and it seemed so improbable that this first has a documented anniversary, I had to investigate further. I did find it referenced in several places, including the book Colonial American History Stories – 1214-1664: Forgotten and Famous Historical Events by Paul Wyoming. Jacques Cousteau died June 25, 1997. Farrah Fawcett and Michael Jackson died June 25, 2009. French philosopher Michel Foucault died June 25, 1984. Here we are going to make the very likely cognitive leap that somewhere there is a photo of Farrah Fawcett riding in, or sitting on, a Pontiac Firebird, a car that was first assembled in 1967, in Ohio. Do you know who else is from Ohio? Willard VanOrman Quine, who was born in Akron, Ohio, who, coincidentally, I am related to. Willard’s mother Harriet was the daughter of James, who was the son of Oliver, who was the son of James, who was the brother of John, my 4th great grandfather. So, stick a fork in it, I’m done.